The production of the few issues of Kommunist in the spring of 1918 signalled a turning point in the revolution in Russia (although even its editors only dimly foresaw it). Everyone knew that without a world revolution the prospects for socialism in a country like Russia were poor. But, whilst waiting for the rest of the world to respond to the beacon of revolution lit in Russia, the question remained as to what should be done to confront the numerous immediate issues facing soviet power. We have already translated all the articles in Volume 1 and they can be found on our website. Now we are well into Volume 2 and the latest contribution is a translation of Radek’s article on the incipient formation of the Red Army. Radek is quite clear that both the idea and the manner of the formation of the Red Army is a necessity forced on the soviet power, not by the internal enemies of the soviet system (who they could have defeated with Red Guards and other militia) but the external forces of imperialism which all had their own plans for dealing with the former Russian Empire. He also sees that the formation of a professional army is fraught with danger for the class character of the revolution itself. After all, as the Bolsheviks knew, and Lenin stressed in The State and Revolution, a standing army is one of the characteristics of any state form, and hence takes the revolution in the opposite direction to what was originally intended. Radek himself though sees only the danger that the Red Army could become detached from its class base, and become a “praetorian elite” dictating to the “government of the workers and peasants”. He is consoled though by the fact that only workers and peasants are to be allowed into this army although he would have preferred the arming and training of the entire working class (i.e thus preventing a monopoly of arms in the hands of a newly emerging state). He simply recognises that, in the Russia of April 1918, there were insufficient resources for such a step to be taken immediately. Not all these “Left Communists” of 1918 abandoned their principles as readily as Radek. In 1920 in The ABC of Communism (which has often been described as the Bolshevik Party programme of that time) Bukharin was still pointing to the temporary nature of the Red Army. And as everyone in the Bolshevik Party at the time knew “bureaucratism” was the consequence of the lack of workers’ initiative. This did not stop Trotsky from proposing that the very military success of the Red Army was thus a model for the entire economy and the “militarisation of labour” was his solution to the dislocation and disorganisation brought about by four years of imperialist war and three more of civil war. The consequences of this were an economy living from hand to mouth and producing only a tiny fraction of what was produced in 1913. On top of this the class character of the Red Army altered dramatically. Initially it had been hoped that it would be a volunteer army of mainly workers with some peasants. However it was soon realised that this was unviable and the Soviet Decree of April which occasioned this article by Radek brought in compulsory military training for all males between 18 and 40. Radek can see the need for the army to be predominantly made up of workers: the task of the communist workers is to prevent the revolution from degenerating, by drawing on the mobilisation of the proletariat. The more the proletarian character of the revolutionary army is reinforced, the easier it will be to avoid the above mentioned danger. This though is not what, in fact, happened. As the war dragged on and more recruits were needed the Army eventually grew to be some 5.3 million. Clearly such numbers could not have been achieved if the workers were in the majority. In fact, by 1920, 75% of the Red Army were peasants. Radek in 1918 was not to know this but the Radek of 1923 we quoted above is already turning a blind eye to the central problem posed by a permanent armed force not controlled by the mass organs of the class. The revolutionary army, like the Cheka, or any other instrument of power, when out of the control of the soviets becomes a force against the self-activity of the class, and ultimately can be used against the class itself. They are also the basis of the new state institutions which arose out of the defeat of the revolution. Radek uses the term “mobilisation” but whereas the mobilisation he is thinking of comes from below, by 1922, as Simon Pirani so admirably demonstrates in his The Russian Revolution in Retreat, this has become mobilisation from above. Over time this top-down mobilisation of the workers becomes the model for Stalinist state capitalism and was widely copied in the campaigns of its epigones from Cuba to Czechoslovakia. The work of the Left Communists does not explain why the Russian Revolution failed (as this was entirely due to its isolation) but they do point to precisely how it failed, and in this they give us valuable insights for our own understanding of how the future emancipation of humanity will come about. 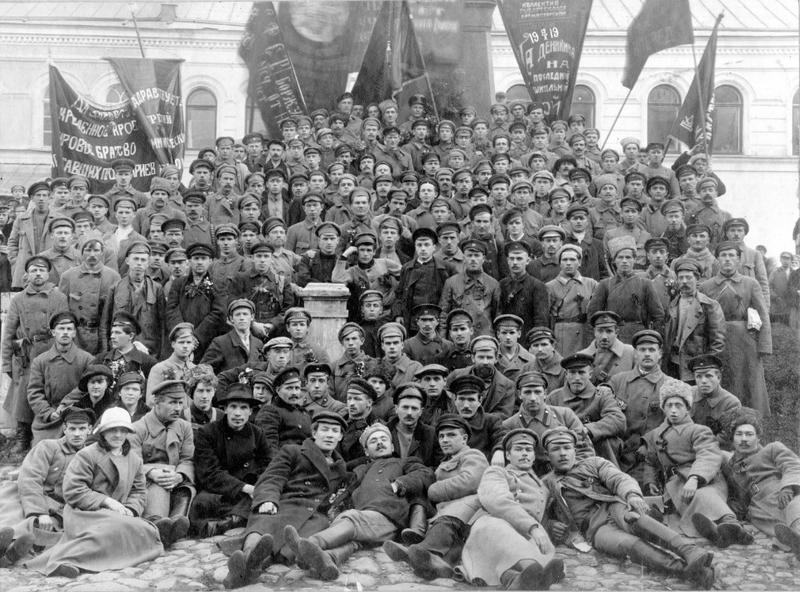 With its preliminary work done, the Russian workers’ and peasants’ government has created the workers’ and peasants’ Red Army. After a brief period of reflection, they drafted a plan of action and presented it to the Central Executive Committee (CEC) of the Soviets. The week before the 1 May (the festival of peace and fraternity of the peoples), the day a representative of German imperialism arrived in Moscow , Trotsky outlined the basis of the military organisation to the CEC tribune. Although they had already been approved by the vast majority of the CEC, the discussions at the heart of the party revealed that there was no unanimity in the ranks of soviet democracy on how the revolutionary army was to be constructed. Creating the army would require not only great efforts of organisation, but of politics and propaganda as well. The question of how to create the soviet army was extremely complex and totally unprecedented for the soviet masses, as well as for their leaders, and we will have to face this question time and time again. Today, we can only deal with the questions that that have been raised in the discussion, and how we should resolve them. Do we need a soviet army like this one? Comrade Trotsky has stated, quite correctly, that to prevail over the Russian counter-revolution, there is no need for any great military unit. As long as the popular masses support us, we can combat the counter-revolutionary attempts of the bourgeoisie with the help of the hastily formed partisan divisions. In the event of our failure to resolve the organisational problems posed by the revolution, or in the event that the masses abandon us because of our inability to build this new organisation, this army that we have been constantly working towards will not save us. However, the more audacious among the Mensheviks and the SRs, who have tried to keep hold of their power against a popular insurrection by putting bayonets back in the hands of mindless people, could have thought that we were planning to build an army to keep ourselves in power even if the working masses were against us. The army is necessary to the Russian Revolution mainly for the purpose of its struggle against global imperialism, although we did not want to reconquer the seized territories of Russia with our weapons. We have declared that we had no desire for military revenge, and that was not just empty diplomacy to reassure the German imperialists. Clearly, we are staying where we are and we trust the popular masses of Europe to defend the interests of the oppressed people of Poland, Lithuania, Latvia, Ukraine and Finland. But we must create a military force to prevent German imperialism and its allies from seeing the Russian Revolution as an easy target. The Japanese intervention showed that when we speak of the imminent threat to the Russian Revolution posed by global imperialism, these were not just empty words – this is a very real fact. We are witnessing an era of profound upheavals, and when the thunder of the European Revolution sounds, the Russian revolutionary army will have an active role to play: not only as the initiator, but also as the organised detachment giving aid to the popular masses in revolt, who will have to carry out a difficult struggle against a well organised class enemy. An army which would tolerate in its ranks the bourgeoisie, and, subsequently, the petty bourgeoisie masses opposed to the proletarian revolution, would not be able to fulfil its revolutionary aims. It is not a question of arming a percentage of the proletarian or non-proletarian stratum of the population, but of the role that the bourgeoisie could play given their higher level of intellect compared to that of the workers. The fact is that class conflict would divide the army, destroying its internal relations and, consequently, the source of its strength – the consciousness of the common goal uniting all the soldiers. Since the construction of the Red Army and its social content are both predetermined by the character of the revolution itself and by the international situation, the conditions are more difficult than the method of achieving this goal. It would be easier to start with the military education of the working masses and peasants and construct the army from the popular masses from the outset. But for now, we are unable to realise this immense task; we lack a local control unit, an education unit, instructors and ranks for command; and we do not have enough arms at our disposal. Moreover, such an army would require immense resources, transport and connected industry. The modern army is more than a mere conglomeration of individuals, it must endow itself with a technical unit and a centralised administration. The creation of such an army requires a long process of building strength and organising the victorious revolution. But this process in turn requires a management unit ahead of assuming its important role in transportation, education and creating the conditions for this whole task of development. It it for this reason that, for now, the education of the ranks of the army of workers and peasants, currently made up of volunteers, is not only a first step towards the general arming of the working class and poor peasants in the future, but also a necessary condition for building the organisational strength of the revolution. The Mensheviks have stressed the danger that comes with the fact that the workers and peasants who have signed up to the Red Army voluntarily have in doing so cut themselves off from their social base. We are not ignoring the existence of this danger; the social stratum that has this army at its disposal is easily penetrated by a particular psychology and may become a class that reclaims its privileges, that has its own interests, and that transforms easily from an instrument of power into power itself. The propaganda that maintains the relationship of the Red Army to its working class background may curb this process of alienation, but it cannot completely stop it. In the barracks, playing cards easily replaces propaganda brochures and life is harder than in the brochure. The real way to save our military ranks from degenerating into a praetorian clique capable of dictating their conditions to the government of workers and peasants is by permanently inserting the working and peasant masses into the nascent Red Army and into education in military arts. Only as long as these ranks continue to compete to arm the population shall it remain the true instrument of the revolution and not the point of departure for the counter-revolutionary unit, whose social base is still difficult to discern. It seems to us that the leading elements of the Soviet Republic do not fully understand this danger and do not dedicate enough attention to the instruction of the ranks of the army, or indeed fully acknowledge that its task is to organise the compulsory education of the working and peasant masses. However, the danger we speak of is not merely the tendency of the ranks of the army to separate themselves from the popular masses, but also indeed the danger that once the armed forces have been formed, the supporters of soviet power will themselves give in easily to the temptation to be satisfied with these first results. In order to teach military arts to the popular masses, we cannot count on the small number of specialists at our disposal. For this, through long, dogged effort, we must engage the entire workers’ democracy in military issues, and form an ideological interest in military art amongst the working masses. Given the mammoth task faced by the soviets, they could forget (settling for the voluntary ranks) the main objective, namely the education in military arts amongst the working masses. Predictably, the problem has not been discussed at all in the CEC, nor in the fraction. We have certainly been made aware of the danger of the counter-revolutionary aspirations of the officers of the old regime, which worries most of those in the soviet camp. The workers, the old soldiers and the sailors, the workers of our old military organisations formed in the struggle with the counter-revolutionary tsarist officers, look upon them with alarm and see in them the main danger. We do not share the optimism of Comrade Trotsky who declared that he had found among these officers a considerable number of people who understood the changes. There are very few officers who understand the objectives of creating the new army and its strategic tasks; only a few isolated officers sympathise with our objectives. The majority of the officers joining our army seek nothing but bread. The elite of our most astute officers, from an intellectual and military perspective, are persuaded that we have chosen the path that will take us much further from what we would have liked, and that we don’t know what we are doing. They do not want to play a counter-revolutionary role, but they are certain that we are ourselves marching towards a bourgeois republic. This is why we believe that the role of the old officers is, and should be, temporary; only a small percentage will join our army and live the same lives as them. It is clear that as long as we still do not have our own communist officers, we remain obliged to put the old ones in the posts of instructors and even in command. Furthermore, we must make every effort to create the conditions for the training of our own officers; the old officers must teach the basics of military arts and transfer them to soviet democracy. The fate of the Red Army is closely linked with that of the revolution in general. The structure of the army still reflects that of the society that has created it. If the petty bourgeois peasant elements take it away from the revolution, if the government of workers and peasants prefers the path of compromise with Russian and international capitalism, no organisational tricks nor preventative measures will save the Red Army from transforming into an instrument opposed to the working class. This is why we cannot consider the Cassandra’s cries of the Mensheviks and the Right SRs historically anecdotal. If the revolution had chosen the path towards which they were leaning (creation of a Constituent Assembly, i.e. a compromise with the bourgeoisie in giving them delegation of authority), the army of the revolution would be the army of the bourgeoisie. What the Mensheviks and the SRs proposed as the basis of the nascent revolutionary army threatens to transform the workers’ revolution into a peasants’ revolution. However, the task of the communist workers is to prevent the revolution from degenerating, by drawing on the mobilisation of the proletariat. The more the proletarian character of the revolutionary army is reinforced, the easier it will be to avoid the above mentioned danger. We do not know whether history will give us enough time to create a solid Red Army and to accomplish a stable organisational effort. Maybe we will construct it in the midst of the perilous struggle? This then would mean we would have to ensure organisation and military instruction on a day to day basis. We must not forget that every lost minute will cost us blood. We must devote our best forces to the creation of the army and to the organisation of the economic apparatus. Yes, we shall not leave our army to the officers and specialists who can only contribute to it their knowledge of military technique; we shall take it into our own hands to inject into it our soul, without which, from our point of view, it would be dead before it was born. In the second half of April, Russia and Germany exchanged ambassadors: Adolf Joffe (1883-1927) left for Berlin and Count Wilhelm von Mirbach (1871-1918) settled in Moscow. Von Mirbach would be assassinated by Left SR members of the Cheka within weeks of taking up his post. This speech by Trotsky to which the editor refers is dated 22nd April but the decree on obligatory military instruction and the decree that created the socialist oath were both adopted at this session had been passed on the 21st March 1918. This however is unfortunately exactly what the Bolsheviks did attempt to do two years later in Poland, in August 1920. The decree on obligatory military education adopted by the CEC on the 21st March 1918 has also been translated into English in: William Henry Chamberlin, The Russian Revolution, Volume 1, New York, Grosset & Dunlap, 1965, pp 502-504. That is, to a more right wing fringe of the Mensheviks led by Theodore Dan (Martov’s brother-in-law).